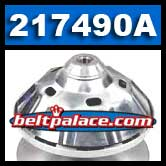 Comet 217490A, Comet 94C Duster Drive Clutch w. Ribbed Cover. 1-1/8" Bore. Home > Comet Clutches and Parts > Comet 217490A, Comet 94C Duster Drive Clutch w. Ribbed Cover. 1-1/8" Bore. Comet 217490A, Comet 94C Duster Drive Clutch. Made by Comet Industries in the USA. 1-1/8“ Straight Bore - 1/4" Keyway - Bore depth: Approx. 1-1/2". Replacement drive clutch for ATV-UTV’s, Side by sides, Snowmobiles, Golf cars, Older Gators (re-powered), and more. Calibrated with nine (9) Comet 211482A Pucks and Comet 205858A Pink spring allowing 1650RPM engagement. "Out of the box" use for 4-cycle engines like Honda, Tecumseh, Kohler, B&S, and their respective clones. Genuine Comet Industries 217490A Duster made in USA!